One of the most fun nights I had was our 25-year reunion. Ours are all self-organized so unless someone takes on the mammoth task they don’t happen. This one the first in a few years and probably explains the 80%+ attendance. TBH I was wavering on actually attending but one of my peers persuaded me to go and I am so glad she did. In the hotel we rented (nearby London Heathrow airport) there was a wedding and a stag night – we outlasted them both. The room I rented was useful solely for changing into my black tie and then changing back out of it in time to catch a cab to the airport that morning and fly home. As for the current education – the new video recording replacing actual attendance suggests that the system remains stuck in didactic learning unsuited to the requirements of our new generation of doctors and the importance of being knowledge workers. Rote learning and testing seems so outdated and unhelpful in the new world we inhabit IMHO. 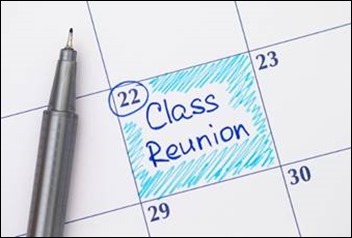 I’ve attended high school, college and flight school reunions. The variation is very interesting since the three environments are fairly different. I’ll compare high school to flight school since they are worlds apart. I rarely interact or correspond w/ anyone from my high school class. Nevertheless, it was a great time to see how lives and careers, and former high school groups played out. For the most part the smart kids were doing better than the not so smart kids. Our school had mostly lower middle class students with a range of kids from the projects to sons and daughters of professionals. Out of 250 only about 15% went off to college. A bunch enlisted in the armed forces. The majority went and got jobs. It was fun and brought me back to the old home town. There’s nothing better than sitting around a tailgater on a Friday night of a high school football game in Georgia. It was great to see success evidenced in many different ways other than pure financial status. After service academy graduation I went off to flight school. The reunions occurred at a now defunct, formerly notorious naval aviation conference. What great fun. Granted, back then it was 95% male, so it was like a frat party mixed in with tamer social and professional activities. Much like medicine, the type of aircraft and year group are analogous to med school and specialty. You are part of a smaller community and those friendships can last a lifetime. The reunions served as a means to reconnect as guys were stationed all over the world. I’d be interested to see the composition and decorum of a current reunion given the changes in opportunities for female aviators and culture in general. Even if I was younger I would likely find a less raucous and alcohol infused atmosphere more enjoyable and inclusive. Since a reunion is about reconnecting and sharing past interests a welcoming environment is hugely beneficial. Everyone wants to look 21 again, and no one does, so overcome those reservations. You won’t regret attending. One other fun factoid about today’s med students I learned, apropos the lecture videos: they watch them at 1.5 to 2 x speed, and only go back to real time for some particularly sticky point. It truly is a different reality they live in. I also love talking to very senior physicians, to see what they think about the sweep of medical history. The famous Seinfeld episode with George having a bed built under his desk.